How do you make an inspirational sports movie without succumbing to all the inspirational sports movie cliches? And how do you make a movie about a working-class Boston family without trotting out the accents, the brassiness, the sheer Boston-ness that has been trotted ad infinitum in other films over the years? To borrow a metaphor from Boston’s favorite team, the Red Sox, David Gordon Green’s “Stronger” sort of has two strikes against it from the start. But the drama, which premiered this weekend at the Toronto International Film Festival, hangs tough and delivers a clean single or maybe more, aided immeasurably by standout performances by Jake Gyllenhaal and Tatiana Maslany and by Green’s decision to downplay the inspiration whenever possible. 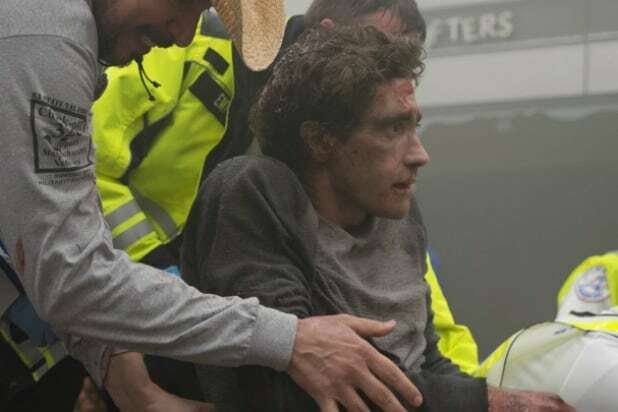 The movie, which tells the true-life story of Jeff Bauman, the Boston native who lost both legs in the 2013 Boston Marathon bombing and helped identify the bombers from his hospital bed, is less about a brave man learning to walk again than about a guy trying to figure out why being injured is considered heroic. But Jeff bristles and also feels deep guilt at becoming the poster boy for a bumper sticker. “I’m a hero for standing there and getting my legs blown off?” he asks at one point — and the answer he keeps finding is yes, because that’s what we need in the aftermath of the unthinkable. The mechanisms of public grieving and the manufacture of uncomplicated heroes is a more complex, fascinating subject than a recovery studded with workout montages — and to his credit, Green is a smart enough and subtle enough filmmaker to make it his real subject. But of course “Stronger” is part of those mechanisms to, and it does contain the pro forma flashbacks to tragedy, moments of doubt and turning points where tk’s determination is reborn. Gyllenhaal, who’s spent the last stretch of his career taking bold, complicated roles and doing them justice, undergoes a physical transformation and finds a rich character in every frozen smile and halfheartedly proffered thumb’s up. Maslany is a worthy partner, playing a girlfriend trying to help but wracked with guilt: She’s dumped Jeff a couple of the weeks before the race, partly because he never showed up for her — and he was at the Boston Marathon just to watch her finish and prove her wrong. There are setbacks and triumphs, family spats and group hugs, because that’s what happens in this kind of movie. But “Stronger” manages to shake off the taint of being “this kind of movie.” Call it Boston Strong, if you must.